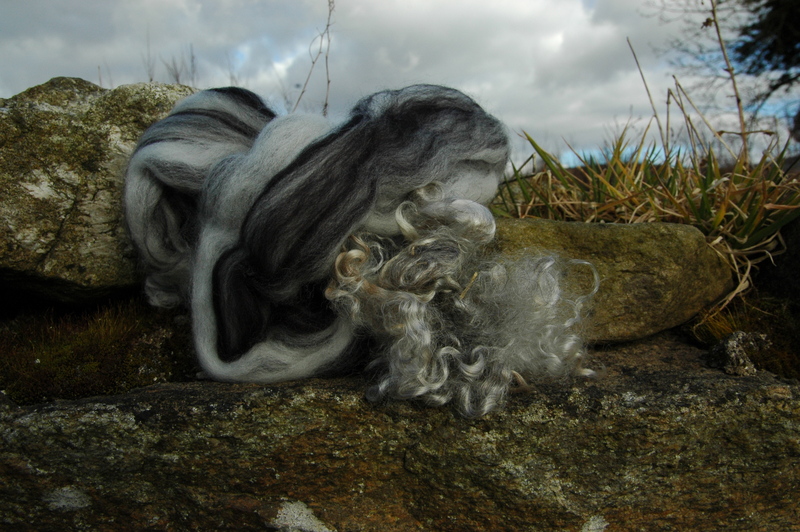 The natural mohair locks that I brought home from the States are a gorgeous mixture of silvery colours and I thought that they would combine beautifully with some more 16 micron merino from Filzrausch, this time a black and white roving perfectly named ‘Zebra’! Cobweb felting is not a technique that I have great confidence in never having had a chance to participate in a workshop on the subject. Instead I’ve learnt from books and practical experience and to be quite honest this latest attempt is by far the best scarf that I have felted to date using this interesting method. If any of you do have some tips and advice about the topic please leave a comment, all info gratefully recieved and put into practice for future projects! Anyway, I laid out the roving along the full length of my table and then teased the fibres out as wide as I could possibly get them without breaking the strands or leaving any areas too open and exposed. Once I was happy with the layout of the merino I teased the mohair locks with my fingers and laid the curls loosly in position. I decided not to place any merino at right angles across the scarf because the mohair acted well to strengthen the felt and I wanted the black and white of design to run lengthwise and really give a sense of movement to the finished piece. I rubbed, rolled, stretched and re-rolled the scarf for much longer than usual in order to create a super strong and well fulled cobweb felt. In some early cobweb experiments I don’t think that I rolled for long enough because after the scarves were worn for quite a number of times they almost seemed to continue felting further widthwise with use. Maybe that is a feature of this type of felt, as I say I really know very little about the subject although I think that this scarf has totally stopped felting and fulling and I hope that it will stand up successfully to many happy seasons of wear! This entry was posted in Felt and tagged cobweb, Cobweb Felt, cobweb felt scarf, cobweb felting, Felt, felt scarf, Felting, merino, micron, mohair, wet felt, wet felting by Nicola. Bookmark the permalink. I don’t know if I love to look at your work more than I love to look at the landscape that you photograph in! Both are extremely lovely! If you will mix the wool with some silkrovings the texture will be like little ricegrains. As fa as I can see this result is very good, special when it can swing with the wind! Just found your lovely cobweb scarf. The black and white is definately eye catching and looks so lovely worn with the black dress. I am currently using silk and merino blends – undyed as well as blends of multiple colours which give beautiful subtle shades. Yes, it is taking me ages to felt them. Look forward to seeing more of your blog. Wow you have me inspired, I was looking at cobweb scarves on Etsy last week and was thinking about having a go. I haven’t done any textiles in ages, (I used to write knitting patterns) . So I have ordered some felting books and wool tops and can’t wait to try it out. Do you know of any online beginners projects for cobweb felting? Your book sounds very interesting, good luck with it. i have ordered a couple from Amazon so can’t wait to see what’s in them, hopefully cobweb felting. I just found your cobweb scarf last week.It has been two years now since you gave away this scarf. I have been making them like crazy and will be selling them at a fair this coming Sunday. I am unsure about selling them not knowing if they are felted enough. I also tried pulling the roving apart and found it tedious. I need to try again. Instead i just lay out the fibers one way with the tufts. It seems to work OK but the edges aren’t as solid. I would appreciate any feed back after your years of making cobweb scarves. Thank you so much! Hi Ammi, thanks for your message, and good luck with your cobweb scarves. I’m not actually sure that I’m the correct person to be advising you on this topic as I really don’t felt many cobweb scarves, I do however felt a lot of nuno ones! From experience my top tip would be to really rub and roll them for longer than with other types of felt, use a sander if you have one as this will really help speed up the felting process. The edges will be lighter than if you have two layers of fibre but that is all part of the magic of cobweb! 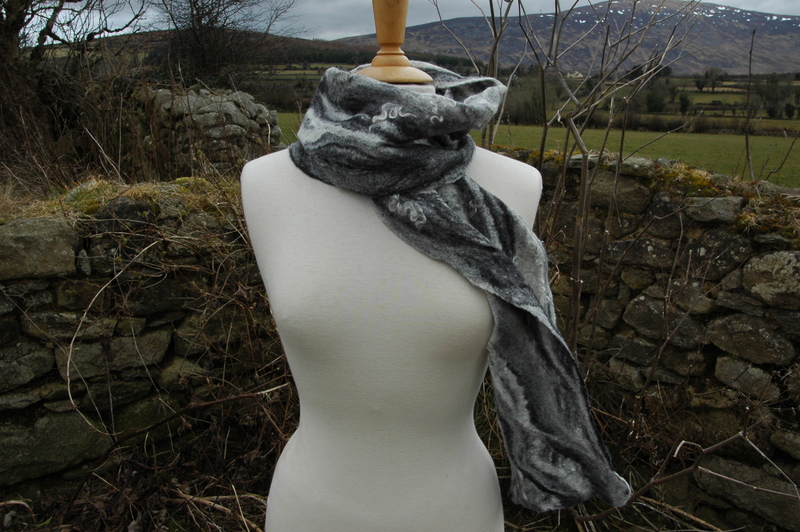 Try wearing a scarf of your own for a couple of weeks and see how it wears, if it is totally felting together on your neck you probably have not felted it enough! i use bamboo place mats on top of the top bubble wrap. this helps to felt quicker. it really works. i have nuno felted scarves and found i was using too thick wool. being a novice, i adjusted to pulling my batt thinner and i liked the results. i didn’t know the words cobweb felting and have just found it. thanks for the info and i am going to try this ,hopefully, in a few days. oops forgot to finish the sentence~~ha-ha. Anyway, is it more than one layer? I don’t know if it is a preference regarding the layers or not by each artist? Nicola, I was having a very bad day. First I forgot to finish my sentence and sent off the e-mail, then I called you Jill in my e-mail…..I think my brain wasn’t awake at the time of writing. Luckily I only have those days once in a while.~~ha-ha. Tried my first cobweb scarf……a bit holey…..by that I mean large holes in some places. I can see it is going to take a bit of practice in laying out the fibers. All in all, not too bad for my first try. Thanks so much for the information. You’re welcome Linda, holes, to my way of thinking, are actually one of the features of cobweb felt, not huge ones but small ones! I would like to try this, but the roving you started with looks so much wider (almost like a batt) compared to the ropes of merino I have. Where did you get that beautiful zebra material that is so thick to start with? I could never spread my merino ropes out wide enough for a scarf! Hi Alison, this merino roving came from Filzrausch in Germany, their website is http://www.filzrausch.de if you want to have a look but any roving will work!